For many teens, braces are a rite of passage. They're one more example of the changes adolescents go through at this time. At Henseler & Kocian Orthodontics in Stillwater and Woodbury, our orthodontists believe orthodontic problems don't improve with age – they just become more difficult to treat. Meaning, your child's teenage years are typically the best time for braces and orthodontic appliances. Generally, by the age of 11-13 the deciduous (baby) teeth have all been lost, the permanent teeth have come in and there is remaining jaw growth we can take advantage of. This is the time to best treat problems that contribute to a bad bite, poor alignment or excess spacing. Treatments designed for teen patients are available at both of our locations: Stillwater and Woodbury! Metal Braces need no introduction. But you might be surprised to find they're smaller and lighter than ever. They also offer some customized options, like colored elastic ties on the brackets. Featuring brackets made of ceramic or composite materials which blend in with your teeth, making them harder to notice. 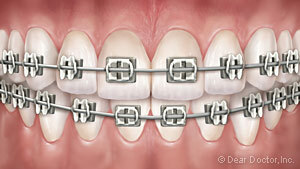 Clear braces work just like metal brace but are less noticeable. 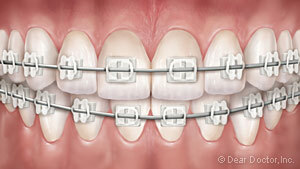 More and more teens are choosing clear braces. Just like the treatment plan for adult, Invisalign Teen is a series of removable, clear plastic aligners that gradually straighten teeth as they are worn. Formerly recommended only for adult patients, they now come with special features — like compliance indicators to tell how often you've been wearing them. Invisalign Teen also can retain the space for teeth that haven't erupted yet and come with six free replacement aligners in case they get lost or broken. Plus, they're almost entirely invisible! Other Orthodontic Appliances appliances may be recommended in some cases, where a major tooth or jaw movement is needed. Although rare, they can range from small devices that fit inside the mouth to jaw surgery. Every patient has different needs. The length of orthodontic treatment depends on you and your specific smile goals. 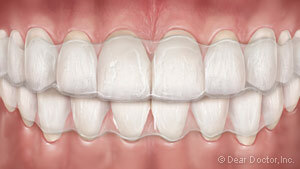 The active stage of orthodontic treatment typically lasts 6-24 months. Afterwards, you will wear a retainer indefinitely, or at least at night when you're sleeping. When your orthodontic treatment is complete, the new smile we've worked together to create will be yours for a lifetime. Set Up Your Consultation Today! At Henseler & Kocian Orthodontics, we want to help you achieve your best smile. Whether it is your first consultation or your last visit, our friendly staff and doctors are always ready and eager to answer your questions and calm any concerns. With offices located in Stillwater and Woodbury, we conveniently serve all of our patients. Feel free to call or stop by to set up your first consultation for braces! A beautiful, straighter smile is right around the corner.